Home → Social Media → Does Social Media help SEO? I’ve owned a small business that I wanted to get in front of as many eyeballs as possible. I’ve also wondered if social media helps SEO. And, I’ve spent way too much time exploring this myself. What if my article gets shared? What if my article gets pinned? What if my articlegets repinned? What if my article goes viral on Google+? What if my article is shared on Facebook? What if it is shared on Facebook 50x? What if people like it or favorite my tweet? Is that a social signal? If you’re on of those people that needs scientific evidence and mathematical proof that social media does not help SEO, feel free to read this article: Social Signals and SEO. Indirect help. Social signals do not help with SEO. Social shares can indirectly help with SEO. For example, the article above that I just linked to I could have seen on Twitter (I didn’t, I found it in search). But, it is good content, content worth referencing. Good content always wins. The chances of social media helping indirectly like this are very rare unless you are putting out some epic content. For most small business owners, their time is 10,000 times better spent blogging. What else indirectly helps SEO? TV commercials, radio advertisements, and better yet, real life interactions. 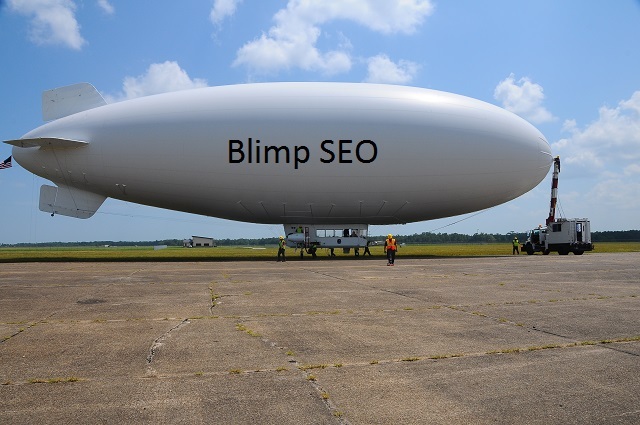 Heck, you could fly a blimp around a city and get indirect SEO. Personalized search. One example of personalized search is the use of Google+. If you have me in a circle and I have posted something on Google+ related to what you’re searching for, you’ll see my plus post. Unfortunately, very few people in the United States use Google+. Twitter. May 19, 2015 Google introduced tweets into Google search. Not all tweets display though- you can’t simply tweet something and have it magically appear in Google search. Better search rankings and content, content, content. For most business owners, they could greatly benefit from showing up in search when people need their products or services. Social media helps some businesses, such as micro-breweries. Heck, some businesses exist on social and don’t even need a website. For the rest of us, it’s all about a great website that performs well in Google search, and that has nothing to do with social media. UPDATE: July 2015 – It has been repeatedly brought to my attention that Bing’s Duane Forrester says social signals are an important SEO factor. I don’t think he said anything of the sort. Bing clearly states here exactly how social signals affect SEO and it is in line with what I typed above- aka links (not likes or +1’s). I paid some company thousands of dollars to share things on Facebook for me and it never helped. I wish I had read this sooner. Thank you. Ouch. Right. What you do on Facebook has nothing to do with how your website ranks on Google. Facebook shares are actually less valuable than Tweets or Pins as Google can not index Facebook.